What are the Benefits of Duraglaze Rooflights? We can provide all of our rooflights in bespoke dimensions – enquire now for more. If you would like to take a look through our Duraglaze collection you can see them here or if you would like to find out more please get in touch with us at info@directrooflights.co.uk or call us on 01670821166. There’s so much choice when it comes to picking the best rooflight for your property. Different shapes, sizes, materials and colours. Our team are always on hand to help you make the right decision and our helpful blogs are here to give you more information on the things you want to know most. All of our roof lights meet Building Regulations in regards to fire-resistant properties but polycarbonate is a naturally fire-resistant material, accepting a lot of heat exposure. Want to know more about our range of polycarbonate rooflights? Visit here. Alternatively, contact our sales team on 01670 821166 or at info@directrooflights.co.uk. You’ve decided to buy a rooflight – you want clear glass, double glazed, hatch access but what about the frame? There’s many factors to consider when purchasing a rooflight, here we give you six of the best reasons why a UPVC frame will be the perfect fit. A UPVC rooflight frame provides a smooth finish which not only looks good but means it is easy to maintain and wipe clean. The ease of maintenance means that the UPVC rooflight will last longer than other materials. A UVPC frame is also a good way to save money on your heating bills. While you may have double glazed glass in your rooflights, insulation qualities of the frame can be equally important. UPVC material is renowned for its thermal properties – saving you money and it is better for the environment. As well as matching windows and French doors in your house, a UPVC frame is aesthetically pleasing. With a smooth finish the material won’t rust, rot, flake or fade meaning it will stay looking good for longer. UPVC is a very durable material, withstanding more than metal or wood – which can be essential in the unpredictable UK weather. As well as not letting cold air in, the UPVC frame is also efficient at keeping outside noise out. Though rooflights are not completely soundproof, a UPVC frame does help to stop you hearing too much outside noise in your home. They are a cost effective frame. Possibly the most important reason for some is that a UPVC frame is less costly than other materials whilst still being of the highest quality. Still not convinced or want to know more? Get in touch with your knowledgeable sales team on 01670 821166 or info@directrooflights.co.uk. Which rooms will Duraglaze work best in? Glass rooflights can be used in any room that isn’t built on top of. They’re great for sky rooms, lofts and dining rooms. Once installed the windows are very easy to maintain with nothing needed other than occasional cleaning. We offer rooflights with features such as self-cleaning and solar control. The external part of the rooflight offers an integrated water management system that sheds water. Should I choose fixed or opening? Most of our Duraglaze rooflights are available as fixed with no ventilation or we can offer hinged products that can be opened to provide ventilation to the room. For opening rooflights, should I choose manual or electric? Manually operated units are supplied with a brass telescopic mechanism and are operated by a winding rod to add as much or as little ventilation as you would like. Electric hinged rooflights are easier to open with a wall mounted button but can be harder to control how much ventilation you require. Will they fit in my roof? All our rooflights come in a range of different dimensions and we can even create bespoke sizes to suit your individual needs. Click here to see our full range of sizes. If you’re still unsure which glass rooflight will work best for you, call us directly on 01670821166 or email us at info@directrooflights.co.uk. Why Buy Rooflights Direct from a Manufacturer? You know where your rooflight is coming from. If you buy from Direct Rooflights our products are all made on our own site in Northumberland which spans more than 85,000 square feet. There is a greater variety to choose from. Not everyone has the same amount of space for a skylight and when you order direct you can choose from a range of styles and sizes that may not be available from some suppliers. When you buy rooflights directly from the manufacturer, it’s much more cost effective than buying from a middle man company. When you buy direct you will get the product for the lowest price. When you order from a manufacturing company you get the product delivered directly to your door. There’s no extra waiting time for your delivery as it is produced and distributed from our Northumberland site. Buy rooflights from Direct Rooflights directly, gives you a 12 month warranty. When your rooflight is delivered it is already fully assembled making it easy to fit. 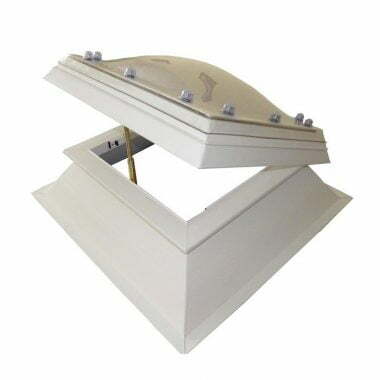 All of our skylights are designed and manufactured by a team of highly trained staff . As we produce the product onsite our staff have full technical knowledge of our products that a second supplier may not have. If you want to know more benefits of buying roof lights direct get in touch through email: info@directrooflights.co.uk, our contact form, or give us a call on 01670 821166. Which Rooflight Material is Best for My Requirements? Choosing the right rooflight to suit your needs can be complex – and this is where we can help. Generally, a glass rooflight is only suitable when used in conjunction with flat panes, insulated units or if attached to a glazing bar system. If choosing a glass rooflight, considerations should be taken in regards to the weight of the rooflight itself which can often be in excess of 40kg/sq.m. Therefore, it is important to check that the structure will support the glass rooflight, particularly if it is a large rooflight. Resistant to UV degradation, glass offers an ideal futureproof solution as aesthetically it will not suffer from weather exposure. As a thermoplastic material, polycarbonate can be reformed, for example into a dome shape. Polycarbonate rooflights can be extruded into flat sheets for use in a single bar system as well as into a multiwall-structured sheet. Polycarbonate rooflights offer excellent performance and boast greater rigidity. With exceptional strength polycarbonate rooflights also offer outstanding resistance when it comes to distributing loads evenly in roofing applications. If you need help choosing the right rooflight for you, get in touch with Direct Rooflights. 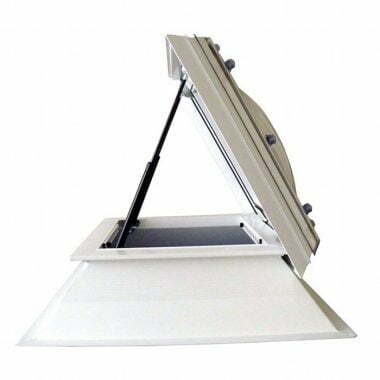 As we manufacture the rooflights directly, we are experts and will advise you accordingly. Feel free to call us on 01670 821166 or email info@directrooflights.co.uk.